Established in 2003, Otaki Museum is a small local museum on Otaki's Main Street. Changing exhibitions display the town's rich past. Admission is free. We are open Thursday to Saturday (during exhibitions) 10-2pm. Otaki Museum houses a comprehensive range of items significant to the history of Otaki and the surrounding district; collects objects, stories, and images of interest; has an extensive photo collection and many early copies of the town's newspaper, the Otaki Mail; holds archival material relating to the town and its people, including records from Otaki School and the Otaki Borough Council; records and collects oral history; and tells Otaki's stories through a changing exhibition programme. The Otaki Museum is housed in the former Bank of New Zealand building, built in 1918. 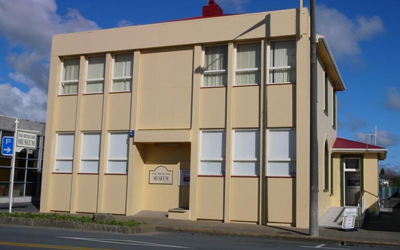 As one of the most historic and prominent on Main Street it was the Council Chamber for the Otaki Borough Council from 1967 to 1989 and housed the local service centre of the Kapiti Coast District Council until 1998. It has been restored by the Museum Trust from its near derelict condition to a state that reflects and respects its historic beginnings. The building incorporates fine timber panelling, an elegant staircase, stained glass windows and beautiful pressed metal ceilings. The building is owned by the Kapiti Coast District Council. The Otaki Museum is governed by the Otaki Heritage Bank Preservation Trust. The Trust was established in 2003. The goal of the Trust is to collect, preserve and share Otaki's history through a programme of changing exhibitions of stories, images and other artifacts. Members: Angela Hill, Sue Carroll, Di Buchan, David Ledson (Community representatives), Meagan Roach (Otaki Historical Society representative), Kerry Bevan (Otaki Community Board representative), and Rex Kerr (Rotary representative) . The Trust is grateful forfinancial support from the Otaki Community Board through the Kapiti Coast District Council as well as other funding organisations. Other financial support and practical support from the people of Otaki is welcome. The Friends of the Otaki Museum support the museum's ongoing work, through ideas, practical effort and financial contributions. Many of this valuable group regularly volunteer their time as hosts at the museum's exhibitions, sharing their knowledge of the town and district and helping make the museum a welcoming place to our visitors. By joining our community of supporters, you can help us preserve and promote the stories of Otaki and its people. If you would like to join the Friends of the Otaki Museum please contact us or pick up the membership form from the Museum. Otaki Museum is part of the Discover Kapiti Heritage Group which is a collection of eight museums on the Kapiti Coast.